This notice offers interested parties the opportunity to provide comments on regulatory measures under consideration to reduce the impact of vaping product advertising on youth and non-users of tobacco products under the authority of the Tobacco and Vaping Products Act (TVPA). Tobacco use is the leading preventable cause of disease and premature death in Canada. It is a known or probable cause of more than 40 debilitating and often fatal diseases of the lungs, heart, and other organs, responsible for the loss of over 45,000 lives every year in Canada. Direct health care costs are estimated at 16.2 billion dollars annually. Nicotine is a highly addictive substance particularly among adolescents and is the principal basis for tobacco dependence. It is also implicated in adverse effects in cognitive function and development in adolescents. The TVPA, which came into effect in 2018, merges the provisions of the former Tobacco Act with new provisions that regulate the manufacture, sale, labelling and promotion of vaping products. The TVPA and its regulations are one of the main tools to advance the government’s strategy to both protect the health of Canadians from tobacco-related death and disease and prevent vaping product use from leading to the use of tobacco products by young persons and non-users of tobacco products. The TVPA limits the promotion of vaping products and vaping product-related brand elements by prohibiting advertising that could be appealing to young persons and lifestyle advertising. The TVPA also prohibits certain types of promotion, including promotion of vaping products by means of sponsorship promotion, through testimonials or endorsements and through flavour descriptors that are appealing to youth. Vaping product advertising that is not prohibited under the TVPA can be further restricted by regulations. The 2018 Public Health Consequences of E-cigarettes report, prepared by the U.S. National Academies of Sciences, Engineering and Medicine, offers two conclusions that are of particular significance in supporting the need to further protect youth and non-tobacco users: 1) there is substantial evidence that e-cigarette (a type of vaping product) use results in symptoms of dependence, and 2) there is substantial evidence that e-cigarette use increases risk of ever using combustible tobacco cigarettes among youth and young adults. The Canadian Student Tobacco, Alcohol and Drugs Survey (CSTADS) results from 2016-2017 indicate that 15% of students in grades 10-12 (Secondary IV and V in Quebec) used a vaping product in the past 30 days, up from 9% in 2014-15. This represents a 64% increase, or roughly 30% per year. Preliminary results from the International Tobacco Control Youth Tobacco and Vaping Survey suggest that there has been an increase in the proportion of 16-19 year old Canadians who have tried vaping in the last 30 days between September 2017 and September 2018. It appears that the rate of youth uptake is rapidly accelerating. Similar observations were noted in the United States, where the use of vaping products in the past 30 days rose from 12% in 2017 to 21% in 2018 (a 78% increase) among high school students. 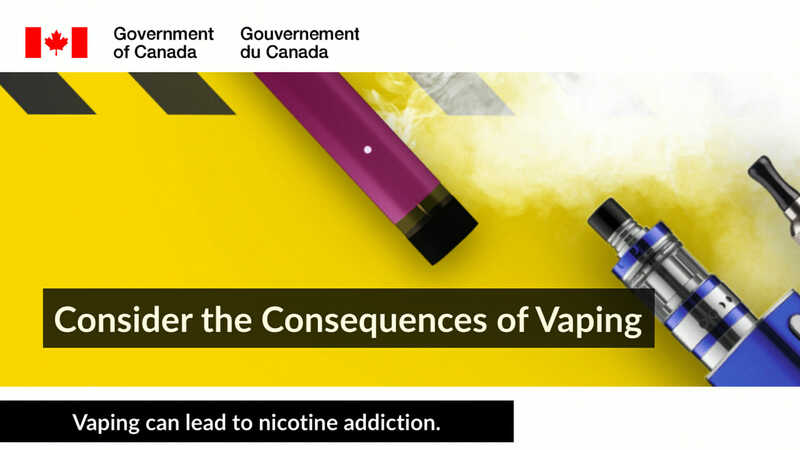 Health Canada is very concerned that the recent introduction of vaping products with high nicotine content and the reported marked increase in youth experimentation and uptake of vaping are threatening Canada’s hard earned gains in tobacco control. Stricter regulatory measures are needed to protect youth and non-users of tobacco products from inducements to use vaping products. An objective of the TVPA with respect to vaping products is to “prevent vaping product use from leading to the use of tobacco products by young persons and non-users of tobacco products”. While Health Canada is proposing measures to support this objective, the Department also aims to help smokers make informed choices for their health, recognizing that vaping is a less harmful option than cigarettes for those who completely switch. This notice provides details on the regulatory measures under consideration to further limit vaping product advertising in order to reduce the impact of advertising on youth and non-users of tobacco products. These measures are put forward in an environment where certain provinces have enacted legislation to restrict advertising of vaping products, including, in some cases, restrictions on advertising in outdoor spaces and at retail locations. However, as of January 2019, Alberta, Saskatchewan, Nunavut, Yukon and the Northwest Territories have no legislation in place to restrict the advertising of vaping products. Health Canada is proposing to limit where advertisements can be placed. Points of sale: Vaping product advertisements would not be permitted at any point of sale where youth is allowed access, including online. However, signs that indicate the availability and price of vaping products could be displayed under certain conditions. As well, catalogues or pamphlets that provide information on the brands of vaping products available would be allowed at any point of sale, provided that they are not publicly displayed and are only made available to an adult customer upon request. These restrictions would not apply at points of sale where youth do not have access (e.g. a vape shop that does not allow youth on its premises or its website), as long as the advertising material cannot be seen from the outside of these places. Public Places: Vaping product advertisements (e.g. signs) would not be permitted in certain public places where youth have access such as shopping malls; recreation, arts and cultural facilities; parks; in public transit vehicles and stations; billboards and other outdoor physical supports for commercial advertising. Broadcast Media: Vaping product advertisements would not be permitted in broadcast media during or adjacent to (within 30 minutes before or after) all children’s and youth-oriented programming at all times of day and night and on all channels. Publications: Advertisements of vaping products would not be permitted in children’s and youth-oriented publications. This would include electronic publications such as websites and social media platforms. In order to enhance public awareness of the health hazards of using vaping products, Health Canada is considering requiring that advertisements include a health warning. The content, format, size and the manner of display of the health warning would be prescribed by regulations. This requirement would apply to all advertisements. Vaping products release chemicals that can harm your health. Youth and adult non-smokers should not vape. In both instances, attribution of the health warning to Health Canada would be optional. Another measure under consideration is to restrict the visual content of advertisements to only text and illustrations or images of the vaping product or its package. Where the advertisement only has an audio content, the applicable health warning would have to be read. Health Canada is considering measures to restrict the display of vaping products at point of sale. Such restrictions would not apply at points of sale where youth do not have access (e.g. a vape shop that does not allow youth on its premises or that blocks youth access to its website), as long as the products cannot be seen from the outside of these places. Canada is a Party to the World Health Organization Framework Convention on Tobacco Control. Article 5.3 of the Convention obliges Parties, in setting and implementing their public health policies with respect to tobacco control, to protect these policies from commercial and other vested interests of the tobacco industry in accordance with national law. Therefore, the Government of Canada takes measures to limit interactions with the tobacco industry to only those necessary to effectively regulate the industry and the products it sells. You must declare any perceived or actual conflicts of interest with the tobacco industry when providing input to this consultation. If you are part of the tobacco industry, an affiliated organization or an individual acting on their behalf, you must clearly state so in your submission. We are also interested in being made aware of perceived or actual conflicts of interest with the vaping and/or pharmaceutical industry. As such, we request that you please declare this, if applicable, when providing input. If you are a member of the vaping and/or pharmaceutical industry, an affiliated organization or an individual acting on their behalf, you are asked to clearly state so in your submission. The comment period to provide feedback on this notice ends on March 22, 2019. There will be further opportunities to provide comments throughout the federal regulatory process. Comments received in response to this notice will be used to inform the development of proposed regulations to limit vaping product promotion. Stakeholders and interested parties are requested to provide their comments to the Manager, Regulations Division, Tobacco Products Regulatory Office, Tobacco Control Directorate, Controlled Substances and Cannabis Branch, Health Canada, in electronic format (Microsoft Word or Adobe Acrobat) to hc.pregs.sc@canada.ca or by mail at Address Locator 0301A, Tunney’s Pasture, Ottawa, Ontario K1A 0K9. Health Canada – February 5, 2019.